I love the concept of Wink & Nod; They call themselves a "culinary incubator" and allow a new restaurant to run their kitchen every six months. This keeps the menu fresh, and allows people to experiment with new dynamic cuisines that would be too risky in a traditional restaurant setup. 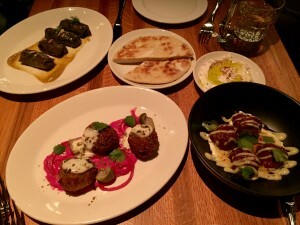 The newest pop-up is Pelekasis, which serves modern Greek fare. What does that mean? 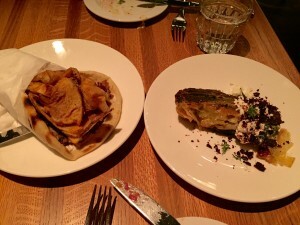 Well, it means the grape leaves ($12) have foie gras, and the tzatziki is updated with green apple. Meatballs? Those are made with wild boar. And the Gyro you love so much? Instead of lamb, it has honey-brined pork belly. I don't know what it says about falafel ($10) that they weren't really able to update it, but they decide to serve it with a beet tzatziki. The spanakopita ($12) was touted as having "100 layers," and it was good, but fell a few layers short. I liked everything; I thought it was all very good. The meatballs ($13) had a nice sear on the outside and a springy texture inside. The falafel was tender. The foie gras in the grape leaves was subtle, but present. I loved the freshness of the green apple in the tzatziki. The one small round of pita ($7) it came with was insufficient. In fact, I would say all the potion sizes were small for the cost. The Gyro was delicious; I loved that it was topped with crispy fried potatoes. But at the end of the day, I ask myself is this $16 pork belly Gyro better than the traditional one I get at Greek Corner (Cambridge) for $7? Not just better, but more than twice as good? The answer is no, absolutely not. I guess what it comes down to is that I love traditional Greek cuisine, and I see no need to mess with it. The meal for two, plus a glass of red wine, came to $100 including tip. I could feed 4-6 people at Greek Corner for that price. Wink & Nod is a neat space; a short flight of stairs leads you into a dimly lit basement space with dark leather banquettes. It aims for to embody "Yesteryear’s Speakeasy With Modern Flair," They have an extensive list of craft cocktails and even have a scotch club on Tuesday nights. You should definitely check it out for a drink…and then go to Greek Corner for dinner.